The bare white walls of our office were beginning to feel oppressive, and certainly not inspirational or interesting. I was asked to create a series of murals that would liven up the workspace, and the imagery was up to me. I began to explore the idea of bringing in a natural motif for the first piece and it evolved from there. I created representational patterns for the variety of plants and environments, then added wildlife to bring more visual interest and break up the busy patterns. For the second mural I wanted to do the opposite of the first. It's all about man-made environments and incorporating the company's Chinese name. 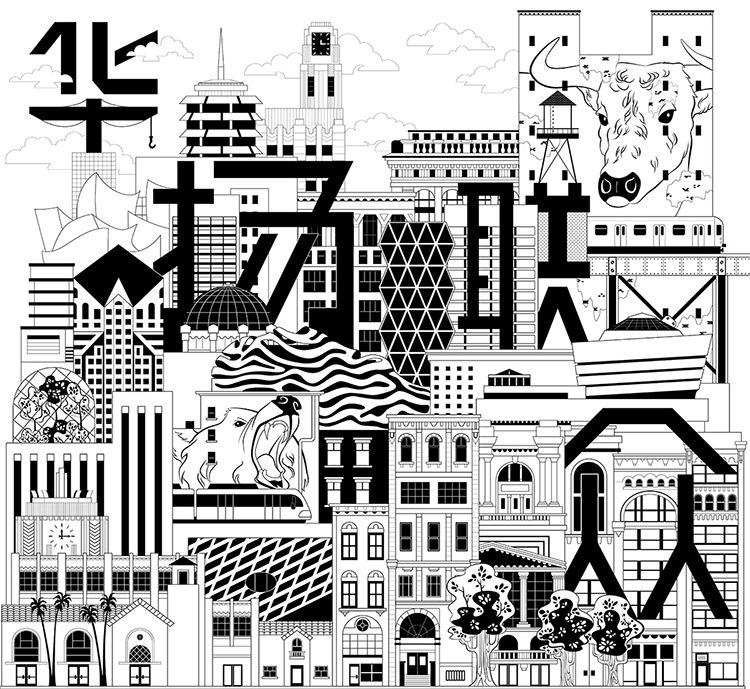 I created a cityscape that has Los Angeles and NYC mixed together, a symbol of our two U.S. offices. The final piece is a continuation of the previous one, but it brings together the natural world of the first mural and the man-made world of the second. NYC is a good subject for this thanks to Central Park and the Highline, so I brought them together and pushed my patterning and textures even further.